The use of CubeSat-scale spacecraft for scientific exploration beyond low Earth Orbit will result in as-yet unexplored system requirements for the attitude determination and control subsystem (ADCS). Past missions have demonstrated the efficacy of CubeSats for both technology demonstrations and scientific exploration, but this foundational work has largely relied on the low Earth orbit (LEO) environment to succeed. In particular, the standard suite of attitude determination sensors and control actuators are largely inapplicable to the exploration of a near Earth object or another planet, requiring a fundamental redesign of the spacecraft ADCS. In this work we apply a recently reported control system design architecture known as location-scheduled control to the emerging challenge of designing the ADCS of a CubeSat for interplanetary exploration. The concept of location-scheduled control (LSC) makes use of the basic modularity of CubeSats, as motivated by the CubeSat Standard, to optimize both the physical location of the spacecraft ADCS and the parameters of the control law being implemented. Under LSC, the spacecraft designer is able to select a system configuration that is optimized for the particular science payload being flown, an important feature for interplanetary operations. When operating beyond LEO a CubeSat will no longer be able to rely solely on compact sensor systems such as magnetometers and sun sensors, and will also require additional radiation hardening for the majority of its components. As such, the overall volumetric constraints on the system will be much tighter while the performance requirements of the ADCS will likely be higher than a traditional CubeSat mission. To solve this problem, LSC makes use of a genetic algorithm to search the space of candidate system designs, considering both physical configuration and controller parameters. The final output is a location-based schedule of gains for a certain set of rotational maneuvers which can be referenced by the system designers. 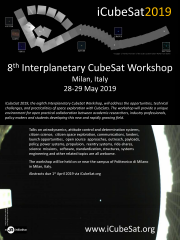 In this work, we demonstrate the use of location-scheduled control for the problem of optimizing the system configuration of a six cube (6U) CubeSat tasked with performing a large-angle reorientation in a deep space environment.